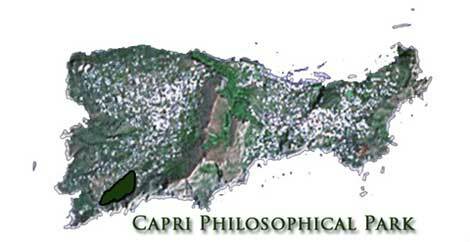 Capri Philosophical Park - How do you find it? Go to Napoli, Naples, some 150 miles south of Rome. There are excellent trains every hour between Rome and Naples. Take a taxi to the main port in Naples, Molo Beverello. Buy a ticket for Capri in one of the many ticket offices there. When you arrive to your hotel on the island of Capri and feel ready for an excursion, ask for the bus to Anacapri, go to the end stop, "il capo linea", the only stop after Piazza Caprile, and ask the driver or anybody from the place for the way to Belvedere di Migliara where the Park is located. You can walk there in half an hour. If you come around lunch or dinner time, and intend to eat at the excellent restaurant Gelsomina, which also have five hotel rooms under their 21 meter long swimming pool, you can phone number 081 837 1499 and ask them to come and get you. Then you wait for some ten minutes and a gray minibus will come and get you. You can also find it at www.maporama.com if you enter Italy, via Migliara, and the postal code 80071. Ask at Gelsomina for the entrance to the Park.If you are born on such a lovely island as Capri, you never want to leave it.